Enterprise business applications require extreme reliability, performance, and scalability, and the ability to define customize functionality and specialized interfaces. 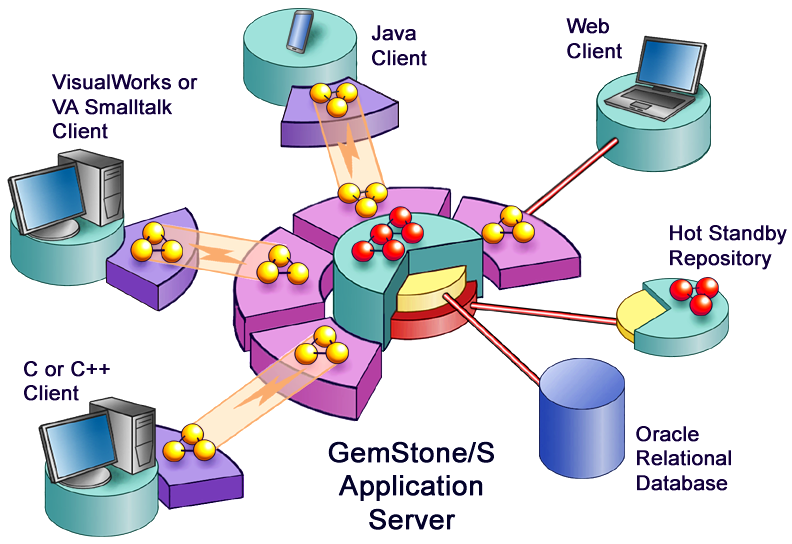 The GemStone/S™ Smalltalk object persistence and application servers provide an advanced platform for developing, deploying and managing scalable, high-performance, distributed multi-tier applications. For decades, financial institutions, telecommunications, manufacturing, transportation, and utility companies have chosen GemStone to provide the robust, scalable, secure, and flexible environment required for mission-critical 24×7 applications. It integrates with Smalltalk, Java, C, or Web clients on the front end. The active, multi-user, transactional Smalltalk execution engine on the server provides an environment for managing billions of objects and hundreds of gigabytes of data and supporting thousands of concurrent users from non-homogeneous clients. On the back end, GemStone/S 64 Bit directly integrates with the Oracle relational database management system through the use of GemConnect®. An open and extensible architecture enables developers to build interfaces and wrappers to integrate external information resources—everything from data warehouses to machine control systems. Our customers include fortune 500 companies, small organizations, and government entities, in the US and internationally. See a sample of our customers here: Customers Of GemTalk Systems. GemTalk Systems provides attentive, world-class support for our customers through all aspects of design, deployment, and maintenance. Our Professional Services team can provide targeting training for your team, or consulting to assist with design, integration, deployment, or any other aspect of your GemStone project. Our Engineers can get involved more closely with your team by establishing ongoing team augmentation. Purchasing GemTalk Technical Support allows your designated contacts to ask questions about GemStone products and any issues related to GemStone that arise. When you are in production, purchasing additional 24×7 production-down support allows you to get GemTalk Engineering involved in critical issues any time of the day or night, 24x7x365.